I'm excited to be participating in the Summer Favorites Adornit Blog Hop....even more excited to sit down for a bit and check out the amazing artists involved. Here is a list of all of those involved including links to their blogs. I used many of my favorite Melissa Frances supplies on the jars and card...including designer stickers, paper, chipboard, Mica flakes, rubon, and resin. Thanks for stopping by and I'm happy to direct you to the blog of Tanya Smith, the next artist involved in the Adornit Blog Hop. Hope your summer is sweet. This too shall pass....an icy cold Coca Cola for me and a Diet Dr. Pepper for...him, and all is well....we are partners in crime. Something soothing today....created with Tattered Angels Creme de Rouge Nature Glimmer Chip, an image from the Beach Bingo Board collection, and Glimmer Mist in Sea Glass, Tea Rose, and Tuscan Sun. I also used paper from the Baby 2 Bride collection from Graphic 45 and my most favorite rubber stamps from Cavallini and Co. And then of course there is a bit of my treasured, trashy, cardboard....it's my fave thing right now...and it's dirt cheep...sometimes free...in abundance...and often overlooked...but not by this girl...nope. Before I go....some sugared cherries and stampin' for you. Papertrey Ink Everyday Button Bits and Tags from Spring stamp sets,Hibiscus Burst and Ripe Avocado ink, Sweet Blush buttons, Spring Moss grosgrain, Rustic Cream, and Sweet Blush cardstock. I added in my favorite Basic Grey paper and a bit of October Afternoon as well. "Every life has peaks and shadows and times when it seems that the birds don't sing and bells don't ring. Yet in spite of discouragement and adversity, those who are happiest seem to have a way of learning from difficult times, becoming stronger, wiser, and happier as a result." Outside the thunder is rolling, the clouds are gathering, and I'm hoping for a nice summer rain storm....a simple pleasure...my little one is playing dress up...I'm gearing up to make some apricot jam....waiting 'til 3:00 to put a roast in the oven...the laundry is almost all folded....I don't know if it's ever all folded :)....a day in the life of me...very uneventful, but I love my life. Perfect...nope....but at the end of the day, all I have to do is count my blessings, reminisce a bit, and I haven't one thing to complain about. Created using Tattered Angels Regal Alpha Framed Font, Vintage Pink Glimmer Mist, Graphic 45 paper, Melissa Frances rubon, and a Prima chipboard button. Papertrey Ink supplies included in this card, are Rustic Cream cardstock, Mega Mixed Messages, Guidelines Two, and Forest Friends stamp sets, Fresh Snow, Smokey Shadow, and Scarlet Jewel ink, Sweet Blush satin ribbon, and a Scarlet Jewel button. The paper is from Basic Grey, and the sweet chipboard swirlie from Maya Road. Now for a bit of news....I have a new card kit back in stock at The Scrappy Gourmet...here's a peek for you and here's a link to the kit. And....a new project up for sale at Frost it Pink....it's my Bless Our Home project kit. You can find it here. And a little peek of it as well. Perfect pairs....such as peaches and cream, pumpkins and porches, toast and jam, cookies and milk, tire swings and apple trees, hugs and kisses, Sierra and mama.....I have a few favorite perfect pairs and today I will share some of those with you through some things made using Ruby St. Designs supplies. Love the vintage goodies....all entirely beautiful on their own, but oh, so much fun to pile high together. Two new loves here....vintage sewing patterns and doilies....I feel the need to hoard coming on. Vintage buttons, a handwritten note, glitter...all things beautiful. Please find your way to Ruby St. Designs to check out all of their lovely kits...I know you'll fall head over heels as I have. Good morning Sunday....hope you are all enjoying your weekend. Yesterday I cleaned and cleaned and cleaned and it felt so wonderful after a few weeks of being under very tight deadlines....I am feeling the happy sense of slipping back into my happy, ordinary routine....have I ever mentioned how I love "ordinary"...we are friends :) Anyway....my little house needed some attention and now I feel like life is back on track....my new scrapbook goodies have been staring at me for weeks and I've had to give them the brush-off too....but not anymore. So....I'll be doing my best to get my shop filled with a few cards here and there and will be having more fun here on my blog as well. Before my sleepy household wakes up, I wanted to pop in and share a little shabby glam love with you. Lucky, little me....I am venturing down a new road and am designing for the most irresistible, unique, and beautiful shop called Ruby St. Designs. They are based in Australia and specialize in one of a kind, original, vintage, loved, tried and true items....I couldn't be more excited. My package was filled with old ledgers and notes, sewing patterns, Bingo cards, vintage buttons and trims, newsprint, bling, doilies (my new paper-crafting love item) etc....this girl is happy, happy. So...today I'll share one of the projects I created using these findings, and tomorrow the rest. Navy and pink...does it get any better than that? Thank you so much Kris for letting me join you....this is truly a treat. I hear my little one singing in her bed....such a happy thing to hear this beautiful, Sunday morning. I'm trying to play catch up tonight as I have a couple of Emma's Paperie projects to share with you. I had lots of fun with this pocket tag thingy...stamping, rubons, punches, vintage print and images....all of those delectable items :) You can view more projects and get the supplies I used to create this here. And now...a little polka dot chicken love for your soul. Also created for Emma's Paperie....I LOVE the sweet Basic Grey gift box....who wouldn't. A complete supply list for this can be found here. I have some fun new products to share with you today....these are from Crafty Secrets and I adore them....I can show you 2 that I've created and if you check out the Crafty Secrets blog, you'll see many more. They are fun....and completely irresistible. This was created with Crafty Secrets Baby Girl Vintage Postcard Kit...this kit includes these beautiful images, chipboard, and coordinating stamps. You can read more about this kit here. This is from the Storytime Vintage Postcard Kit which includes these images, chipboard, and a coordinating stamp set as well. I love these. Summer has been so wonderful...my house is filled with happy cousins and I know they are making memories they'll always cherish...I'm so grateful my little one has so many loved ones surrounding her...we are up to 26 cousins right now with 2 more due very soon....crazy wonderful. It's a warm, drizzly, cloudy, summer morning here....I enjoy the change from the brilliant heat and sunshine....rain clouds make me happy here....there are times these clouds bring the little girl who would dance in the rain out in me. I have an expert puddle jumper living under my wings too....she's just like her mama. Today I have a fun project to show you as Tattered Angels and Graphic 45 team up. Heaven knows how much I love Graphic 45 and I am happy to use one of my favorite collections, Baby 2 Bride, for my project today. I used a Tattered Traveler Pocket Watch Framed Font from Tattered Angels as my focus on this card and tried a new-to-me technique. I coated the chipboard piece with spray adhesive, then covered it with gold embossing powder, heated it up, distressed it with ink, and transformed it into an antique piece. I'm anxious to try this technique with different colors of embossing powder. These chipboard pieces are so much fun to work with....endless possibilities. I also used some Webster's Pages trim, Prima flowers, Papertrey Ink button and ribbon, Melissa Frances rubons, and some Zva Creative adhesive pearls. Be sure to check out the Tattered Angels blog for some beautiful prize packages and if you click on the Giveaway Tab, you'll find another prize package including products from Tattered Angels and Graphic 45. Also...The Scrappy Gourmet is making room for new products and is having a sale....they carry so many fun items, including oodles of Melissa Frances. They are a great resource for Melissa Frances products. Combine shortening, sugars, eggs, and vanilla. Mix until creamy and add in flour, salt, baking soda, chocolate chips, and nuts. At this point I add in about 1 tablespoon milk so that my dough starts to stick to the sides of the bowl...then it's just right. bake at 35o degrees for 10-12 minutes. Enjoy! Tonight we took a different route home after we picked my little one up from my parent's house in St. George...they live about 2 hours from us and this weekend they spoiled her like grandma and grandpa do so well. We had the big truck on our journey and my husband was in the mood to reminisce, so off we went on a dirt road through the mountains...it was the most beautiful ride...we are used to nothing more than country roads here, but this was different. I love to be up in the mountains where the sunbeams stream through the clouds and touch the meadows and turn golden in the sunset. The wildflowers bounce a happy hello as we pass, and everything seems completely and perfectly as nature intended it to. We also stopped to check on the mules and horses in the pasture....Jack and Jill, Pepper, Scamper, Cisco, Mouse, and the new fellah who is a beautiful buckskin mule. I love how they follow us around like loyal, loving hound dogs...I'm officially a mule-lovin' kind of girl. My favorite mule had to be put down just recently...his name was Rosco...he took me on my first deer hunt and I felt like he was stronger than a bulldozer as he plowed through the brush and trees....not to mention he was beautifully brown like a chocolate bar. We enjoyed the tadpoles and frogs in the pond and it seemed to make our Sunday extra special as we were once again 3 instead of 2. A couple of things to share tonight. Lots of things I love piled on this card....some Tattered Angels chipboard, Glimmer Mist, and a Glimmer Screen used on this along with a Creative Scrap from Crafty Secrets...then of course a typewriter key (which I could hoard like my favorite See's chocolate), a Prima flower, a Maya Road trinket pin, Melissa Frances paper, and cardstock and paper from Papertrey Ink. And now a bit more glitter for you on a project I created for the Tattered Angels booth...just a peek or two. This project combines Tattered Angels Regal Alpha Framed Fonts, Regal Creme de Rouge Glimmer Chips, and Creme de Rouge Glimmer Mist along with Melissa Frances paper and resin, Crafty Secrets vintage image, Making Memories metal, and a few vintage favorites. And...lastly a little hocus pocus peek for you...also created for Tattered Angels using their new Bingo Boards and other soon to be released products. So many fun products to look forward to. Bedtime for the little bean. I'll post the Chocolate Chip Macadamia Nut Cookie recipe in a day or so...promise. baking is the key word here lately....whether we're outside or in the kitchen...I keep thinking one of these days I'll adjust to our desert heat....but apparently I'm not there yet. I'm heading into the kitchen to make something tasty...I'm thinking Chocolate Chip Macadamia Nut Cookies. My sister-in-law is from Hawaii and she and I have been swapping scrapbook supplies and macadamia nuts....and I am ever so grateful for the stash she shares with me. First my card for theCPS blog this week. Papertrey Ink Polka Dot Basics II and Tags for Spring stamp sets, Rustic Cream cardstock, Vintage Cream and Spring Moss buttons, and Berry Sorbet ink, Webster's Pages paper, Basic Grey die cut, and a sweet petite wood house from Kim Hesson. Also a few cards made with Papertrey Ink's new release stamp sets. First up...created with Dawn McVey's new Mod Squad stamp set...so much fun. Next are Lisa Johnson's On my Couch and Additions stamp sets...these are brilliant! Off to bake. Enjoy your night. Hello to you...Have you ever noticed that summer has it's own beautiful dance....it's sometimes slow and graceful....like sitting and dipping your toes into cool mountain stream...sometimes it's a quick step...like spur of the moment plans to pack up a picnic and head somewhere cool and fresh. I've been trying my hardest to make these busy summer days slow down a bit...but they are slipping by so quickly as we whirl and twirl from here to there...we are now in swim lessons and it's been so fun to watch my little one become more confident....to try something this year that frightened her last year...my favorite part is watching her face light up as she enjoys a simple pleasure of childhood...that of discovery. Her cheeks are summertime pink....I've decided this is my most favorite color. Cousins are visiting as summer wraps up and we love having them around to play with. School starts the middle of August here and my house will be still and quiet and my heart will not know what to do...so I'm hanging onto a few more summer days with my baby before she happily twirls off to be a big 1st grader. A quick something or other for you today.... Such a fun color combo here....this card uses some Basic Grey June Bug sweetness....Making Memories fun finds, a Melissa Frances glitter chipboard flower, a Maya Road trinket pin and metal embellishment, and Papertrey Ink Background Basics: Text Style, Vintage Picnic Sentiments, and Heart Prints stamp sets, Rustic Cream cardstock, Smokey Shadow, Berry Sorbet, and Enchanted Evening ink, and Vintage Cream Grosgrain. Juicy colors that make my mouth water. The rest of my week involves more swimming of course....making sweet apricot jam...and finishing up some CHA projects....it will be fun to share them with you. I hope your summer is sweet and filled with sticky fingers and warm hugs. Rustic Cream cardstock, New Leaf and Ripe Avocado ink, Sweet Blush satin ribbon and vintage buttons, and my favorite Chamomile Tea Vintage ink. In addition to these supplies I used some of the newest, sweetest Basic Grey papers from the Lemonade collection and adhesive pearls from Melissa Frances. It's a warm Thursday, July evening here....we just enjoyed creamed peas and potatoes for dinner....I need to bake some zucchini muffins for breakfast and munchies tomorrow....and my little one is just about ready for stories and bed. She is such a great reader....I am amazed at how she continues to learn and learn naturally....reading has opened up a whole new world for her and I love to hear her studying out words and letting them tumble from her lips as she discovers what they really are....what a fun gift for me to experience as a mom. This was created for Emma's Paperie this week....all glittered and creamy. Step by step instructions and a complete supply list can be found HERE on the Emma's Paperie blog....hope you'll try one...it's a snap. And...a fun card tonight before I go...created for the CPS blog this week using stamps from my friend Tami Mayberry for Sweet N Sassy stamps...ohhhh I love 'em...gonna give 'em lots of lovin' I just know it. Paper from Basic Grey, flower from Prima, bling from Zva Creative, rubons from Melissa Frances, button from etsy, and ticket from Tim Holtz. For those of you who asked, the flowers I used in my button tutorial were from Martha Stewart Crafts...got 'em at Michael's...aren't they pretty? And please remind me of any other questions you may have asked that I have failed to answer. Time for night night here in the desert. Today has brought a sweet sense of acceptance....I have grown tired of always measuring my own worth based on my view of others....I think it's OK to admire and look up to others....I need to always push myself to try harder and do better....but I need to remember to love myself and the person I am right now....time to stop being so hard on myself....look back on the day and smile for the things I did accomplish, even though I may have not gotten everything done....time to stop trying to be and do like others...we all have our strengths and our weaknesses...but we are each important and loved in ways that we cannot comprehend....our differences are what bring beauty, interest, diversity, and compatibility....just make sure I have tried my hardest to do what is right each day...and if I lack or fall back, pick myself up the next day and know that I have a gift waiting for me the next day...that of beginning again. Give yourself the same love and acceptance...it sure is hard isn't it? I have so many wonderful examples around me...I look at them and want their incredible patience...their ease...their ever ready smile...their ability to handle what life throws at them....their incredible faith....their spirituality....the ability to be organized...their ability to love so freely...and I will continue to look up to them, but it's OK to be happy with myself at the same time. Remember we were each created to be unique...there is beauty and goodness in each of us. I made this card for me and for you today using many things that I am enchanted by....and then of course had to take a picture of it with a sweet gift my mom bought for my birthday ...it's a beautiful shabby blue pancake batter mixing bowl...I adore it, I adore it...she's such a great gift giver...I'm a lucky girl to have her as my mama. Gotta go pull the chicken out of the oven. 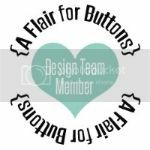 I've never seen, held, touched, or met a button I didn't love....buttons and I go together like PB&J....and today....since I'm tired of being a slacker...I have a fun tutorial for you...we're gonna make our own buttons...yep....grab 'yer gluesticks...let's go. The Crafty Secrets Design Teamies are all sharing a fun tutorial of some sort on their blogs today....so get all comfy...getcha some munchies...and enjoy. Step 2: Select your button image...I wanted sweet vintage faces peeking up from the centers of my flowers so I chose an image from the Crafty Secrets Childhood Images and Journal Notes booklet. Step 3: Trace the chipboard buttons onto the backside of your vintage image. Cut out and adhere to the top of your chipboard button. Step 4: Sand the edges of your buttons and distress with ink. Poke holes through the paper to add holes to your chipboard buttons and tie with hemp, thread, or ribbon. Step 5: Add to the center of flowers to embellish or anywhere else your heart desires. I added a Creative Scrap or two also from Crafty Secrets from the Seasonal Calender collection and then a few other goodies as well. Hope you had a wonderful 4th of July....we certainly did. Who can resist? I hope you are a fellow p-nut butter lover....I know you're a chocolate lover....it's a staple here at Sierra's house :) And...this is our new favorite cookie....daddy loves 'em most I think. I made these the other day and had to hide a few in order to snap a shot for you. I'll post the recipe at the bottom. Busy and hotsie here....pheeew....having a lot of fun swimming with my little fish....and creating my little heart out as CHA is creeping right up on us. For Tattered Angels....the cute wooden crown base, thanks to Kim Hesson, and then lots of Regal Glimmer Chips and Glimmer Mist from Tattered Angels. A peek or two at a new product from Tattered Angels called Glimmer Chip Tiles....Oh I love 'em. And lastly a card... Made with Melissa Frances tag, Prima bling, Little Yellow Bicycle paper and Papertrey Ink Sweet Blush Swiss Dots ribbon, Sweet Blush cardstock, Flower Garden and Remember stamp sets, and Hibiscus Burst, Ripe Avocado, and Fresh Snow ink. Congratulations to Brenda Weaver....she is the random winner of Card Creations 7 magazine from Paper Crafts! Now for the recipe....I tweaked Martha's Stewart's original version a bit and added a few things. Preheat oven to 350 degrees. Using an electric mixer, cream peanut butter and butter in a mixing bowl until smooth. Add brown sugar; beat until combined, scraping down bowl as needed. Add eggs and vanilla, and beat until incorporated. In a small bowl, whisk together flour, baking powder, and salt. With mixer on low speed, gradually beat in flour mixture in two batches. Add in 1 Tablespoon milk and mix in chocolate chips. Scoop off dough by the tablespoon; roll into balls. Place granulated sugar on a plate; roll balls in sugar, coating completely. Place 2 inches apart on a nonstick insulated baking sheet. Bake until cookies begin to puff up slightly, about 7 minutes. Remove from oven. Press one peanut butter cup in center of each cookie. Return to oven; continue baking until cookies are golden brown and chocolate has begun to melt, about 6 minutes more. Let cool at least 10 minutes on baking sheet before transferring cookies to rack to cool completely.